I have always been intrigued by stocks that made the biggest gains, and I found it fascinating to study stocks that went up two, three, or four-fold in a single year. In my first four years as a stockbroker (1999-2002), I spent countless evenings researching the biggest winners of the past year, trying to spot trends or characteristics that the best stocks had. Many weekday evenings, I’d be the only person in the office burning the midnight oil, plotting charts, noting similarities, and searching for clues. On Saturday afternoons, I’d make a one-page synopsis of exactly what the super stock looked like before, during, and after its big run. I not only wanted to know what caused these stocks to take off to stratospheric heights, but how I could devise a way to find the future winners beforehand. I started uncovering secrets that only the smartest minds in the money management business knew; ones they shrewdly kept to themselves. Eventually, I was able to spot the pattern, or theme, that many superstar stocks possessed. From Xerox (XRX) during the 1960s to Starbucks (SBUX) during the 1990s, the great stocks had lots in common as they trounced the market. Time after time, each great stock had certain traits – appealing characteristics – that the other winners had. It was as if they were all poured from the same mold. Armed with this knowledge, I found one stock after another that “fit the mold.” Eventually, I built a portfolio compiled strictly with potential superstars. Some of these stocks I owned in my managed portfolios. Some I merely tracked, because for one reason or another, I failed to buy them. Either way, we were on the same page. This gave me reason to believe that I was on the right track; the track leading to stock success. The best stocks are usually big gainers, year after year, for a long period of time; sometimes for decades. The Home Depot’s (HD) and Dell’s of the world were not flashes in the pan. They were consistent leaders year after year. Bet on a winner. You don’t have to be a rocket scientist to find home runs. You don’t have to be an analyst or have an MBA; you just need some common sense and a little basic math. 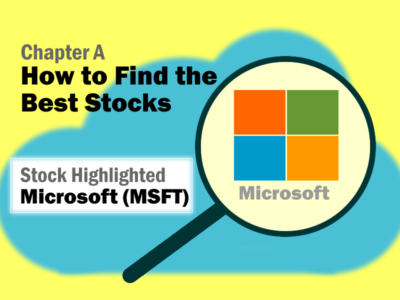 Finding the best stocks is simpler than you think. Another important stock tip is not to be afraid to buy a stock that is up for the year. Most people like to buy stocks when they are down, but good stocks go up and bad stocks go down. Usually, a good stock that is down is down for a reason, and that reason is that its time as a winner is up. The first clue to search for when looking for great stocks is to consider companies with high profits growth – the higher the better. During a given year, most of the best stocks will have triple-digit profit growth. Since it’s hard to keep doubling profits every year, the best stocks will grow at 35% or more, during a three-to-five year period. Microsoft (MSFT) grew profits 43% a year during the 1990s, but most people didn’t pay attention to the stock until the middle of the decade. Catalysts often propel profits to new highs. A catalyst is a product or service that propels a company into profitability beyond their wildest dreams. Sales go through the roof. Profits grow even faster than sales, since demand is so strong the company can pretty much charge what they want. This is exactly what Microsoft did. It charged a premium price for their Windows software. When sales and profits started to slow, a new-and-improved Windows was introduced, and a fresh profit stream emerged. Remember Windows 95? Windows 98? Windows 2000? Those were catalysts. The best stock gains will be derived from the power of compounding. There are two prerequisites to owning a stock that goes up ten-fold in ten-years. One is to hold the stock for ten-years. Stocks have personalities, just like people. Some you can trust, some you can’t. When searching for winners, try to gauge whether the company will be able to make their estimated profits. Has their business been erratic historically, or are you fairly certain that the company will come through quarter after quarter? Is the stock in a stable industry like healthcare, or a wishy-washy sector with booming business one-year, but can’t seem to make a profit in the following year? You worked too hard for your money; don’t take chances with it. Own companies with high degrees of certainty. During the 1990s, Microsoft had a high level of certainty, because it was the only big player in personal computer software. Whether people bought an IBM (IBM), Dell or Compaq, it was MSFT that got the business. Its only competitor was Apple (AAPL), which had its own operating system, but MSFT easily squashed Apple’s threat. MSFT also had high certainty due to the PC revolution. With mainframes going out of style and personal computer sales dominating both the home and office, Microsoft had a steady stream of income each year. The best stocks grow profits consecutively every year. Each time annual profits are up, more investors should be hopping on the bandwagon. This is because the company is faithfully proving its success, year after year. The cream-of-the-crop companies will grow in earnings each year and never incur a down year in profits. Notice in the table to the right that during the 1990s, Microsoft’s EPS (earnings per share, the amount of profit per share of stock) went up every year, never down. When you’re looking to add new stocks, first evaluate whether the company has ample room for growth. If their market is already saturated and its products have been around a while, like steel and automobiles, the company can’t possibly keep growing at 30% a year. The PC revolution gave Microsoft lots of growth opportunity. With mainframes going out of style and personal computer sales dominating the market of both home and office, it was obvious that Microsoft was going to keep growing. Chart One is what Microsoft looked like in 1992, as a small, fast-growing software company. The first numbers I noticed were the outstanding quarterly profit growth figures for the previous four quarters, located at the bottom. 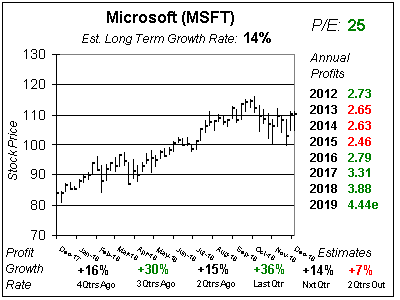 It was clear to investors who followed profit growth at the time that MSFT was a leader. At the right are MSFT’s profit figures since the company went public in 1986, with profits up every year. The P/E of 30 was low, considering that profits grew 47% last quarter. (Figures are adjusted for splits. MSFT was $73 at the time). MSFT should have been bought in the early 90s, as profits were up each year, and the rate of quarterly profit growth was high. Chart Two is a ten-year chart of MSFT during the 1990s. Ten-year charts show annual profit growth rates along the bottom of the chart. If a company had been public for at least ten years, then we also calculate the rate at which profits compounded each year (Yearly EPS Growth) and the rate at which the stock compounded each year (Yearly Stock Growth). In Microsoft’s ten-year chart from the 90s, two characteristics stand out the most (besides the stock going wild). First, at the right, notice Microsoft’s profits go up each year. Second, notice the high profit growth rates at the bottom of the chart. Compounding high rates of growth took profits from $0.03 to $0.70 in ten years, and fueled the stock’s rise. The best stocks are long-term winners. Hold stocks as long as profits continue to grow at 20% or more. Here, MSFT went from $0.61 to $58, almost one hundred fold. Chart Three is a one-year chart of MSFT just after the NASDAQ peaked in March 2000. When quarterly profits were slowing, money managers were selling, but many investors held on, thinking “it will be back”. Notice quarterly profits at the bottom go from being up 23% to no-growth in four quarters. 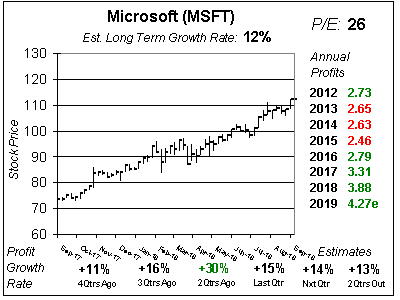 Microsoft stock, even after this decline, was still overvalued with a P/E of 31. When Microsoft’s profits slowed in 2000, it no longer fit the mold of a stock market leader. The 10% and 0% along the bottom were sell signals. The main reason a stock goes up or down is that the stock market went up or down. The second leading factor behind a stock move is the sector, or industry, the stock is in. You could have the worst stock in your portfolio, but if the market is hot and the sector is favored, your stock could double or triple within a year. There have been lots of times I’ve owned a great stock, albeit in a bad sector, and watched the stock spiral downward. Trying to fight sector rotations is like attempting to paddle up a set of rapids. When MSFT was knocking the lights out, all the tech stocks were in vogue. Software companies like Peoplesoft (PSFT), Adobe (ADBE), Oracle (ORCL), and Symantec (SYMC), which makes the Norton Anti-virus software, all went up more than ten-fold in price. Then, when the technology sector went down, all of these stocks fell. One key to winning in the market is to keep an eye on the sectors and have your money in the best ones. Many people like to own what they know, but when it comes to making money in the stock market, it pays to find small and unknown stocks that nobody knows about. For a company to be able to grow profits at 35% a year for ten-years, it has to be small, since it is virtually impossible for large companies to accomplish such a feat. Imagine your current income growing at 35% a year for 10 years. That would be quite an accomplishment, and maybe hypothetical, depending on how much you’re making. A teenager that mows lawns for extra money could accomplish the task, at least for a couple of years. When you are in a stock before everyone else, you’re in on the ground floor. Any new familiarity with the stock brings more prospective buyers. If more people want to buy the stock than sell the stock, the share price goes higher. When I hear people telling me about a familiar stock such as Cisco, which was on everyone’s radar in 2000, I know it’s time to sell. One relatively unknown fact about the best stocks is that they beat earnings estimates while making their biggest runs. In other words, they underpromise and overdeliver. In 1991, Microsoft was expected to grow next year’s profits 26% and ended up with profit growth of 47% in 1992. MSFT nearly doubled during those two years. In 1997, MSFT was expected to grow profits 18% and delighted investors with a 53% profit growth. Beating expectations helps to push the stock up 26% that year. When companies start to miss expectations, start sniffing out new stock ideas. It may be time to part ways since missing expectations often signals a future decline in the stock price. In March 2000, during the NASDAQ’s high, MSFT was expected to earn $0.95 in fiscal year 2001. Twelve months later, those expectations were lowered to $0.89, as the stock declined 50%. One important characteristic most investors miss is the combination of a rising P/E and growing profits. Together, these two can propel a stock price skyward. Notice in the Microsoft table earlier in this chapter that MSFT had a P/E in the 20s during the early 1990s. As the decade progressed, the stock traded for a premium P/E of 67 in 1999. The combination of rapid profit growth and an expanding P/E created a powerful combination for Microsoft stock. David Sharek is stock portfolio manager at Shareks Stock Portfolios and the founder of The School of Hard Stocks. His Growth Portfolio has averaged investors 12% per year since 2003, 4% better than the S&P 500's 8% during that time. David's posted four years of +40% returns in his 16 year career. His book The School of Hard Stocks can be found on Amazon.com.